Cellissimo! L.A. was founded in 2001 at the invitation of Mt. 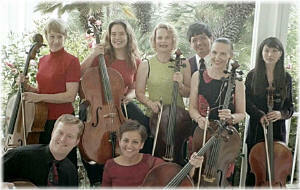 Wilson program director Kate Barlow, to present an all string program for a June event. The group started out with just 5 cellists and it has expanded to 7, with the addition of guest violist, Cesar Chicco, also an amateur cellist. We like to perform all the repertoire from the classical literature, pop classics, and ethnically influenced music. Many of our arrangements were done by members of the ensemble.